The Leonardo whom we discover in Fantasia does not, perhaps inevitably, reveal the same genius of the Leonardo we encounter in paintings such as the Last Supper or the Mona Lisa. These fables and stories show us a Leonardo with whom we are less familiar—a more human and intimate Leonardo, who could laugh and joke and despair. They give us, in a sense, the “table talk” of one of history's great geniuses— the Leonardo that his friends would have known in his moments of relaxation. His obvious joy in telling stories or recording arcane details about mythological creatures suggests that these efforts were sources of great pleasure to him as he worked on his larger commissions. Indeed, many of them were written in the early 1490s, when he was working on the Sforza Horse (a giant bronze equestrian statue) and about to embark on the Last Supper—two projects that were time-consuming and both intellectually and physically taxing. In these stories and riddles, Leonardo undoubtedly diverted himself every bit as much as he entertained the restless courtiers in Milan. And we, too, are entertained. The fables, riddles and bestiary leave us, finally, with the glimpse we get of Leonardo at the start of his marvelous career: the curly-headed youth with the knowing smile, his mind teeming with an abundance of invention. Leonardo's riddles maintain the technique of giving a clever and baffling description of something we see every day, often revealing the paradoxes and absurdities of things we take for granted. A ditch, for example, is something that, paradoxically, grows in proportion to how it is diminished. Those who give light for divine service will be destroyed. Feathers will raise men, as they do birds, towards heaven. 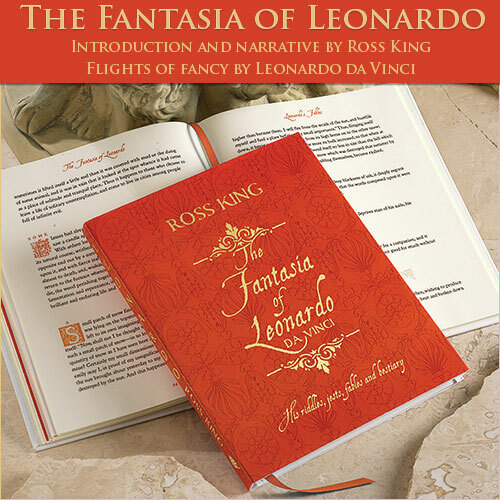 The Leonardo who emerges from these strange fables and quaint tales is an appealing one. In them we get a glimpse of the man who loved learning of every sort, who immersed himself in books, and who elegantly and wittily entertained the courts. From a young age he would have read charming, moralistic stories featuring foxes, ravens, moles and hares. He loved the unusual, the grotesque, the fantastical, the out-of-all-proportion. The caterpillar, which, by means of assiduous care, is able to weave round itself a new dwelling place with marvellous artifice and fine workmanship, comes out of it afterwards with painted and lovely wings, with which it rises towards Heaven. by Ross King, published by Levenger Press, 2010. Copyrighted material.